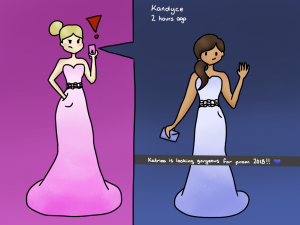 Having the same prom dress as another girl is LITERALLY the worst thing in the world. So, like, I totally got the perfect dream dress. It’s by Sherri Hill, the genius designer. It’s powder pink with the most elegant bedazzled waist. And get this: it has pockets! I was ready to have my dream prom until I found out that that JUNIOR Katrina got the same dress! I mean like, it’s a different color, but still! People will totally be able to tell! Like, is she trying to make a fool out of me? It’s MY senior prom, not hers! She’s had it out for me for a long time and she’s been waiting for the perfect moment to strike. You don’t share your Goldfish with someone during recess one time, and you’re their sworn enemy for the rest of eternity! I’m convinced this is a direct attack on my reputation. Not only did Katrina do me wrong, but the best dress store out there, Peaches Boutique, failed to tell her that I claimed the dress first. I even submitted a photo of it to @conanthsprom18 on Twitter, the school’s one stop source to see who’s getting what dress and from where! My BFF Kalene texted me as soon as she overheard Kami show Kassy a photo she got from Kandyce who took the photo of Katrina while going dress shopping. I just can’t believe she pulled something like this! Since I was a little girl, I’ve dreamed of feeling like a pretty pretty princess on my senior prom night and now I’m not going to be the only special one with my Sherri Hill silk ball gown. Remember when Kaylee wore the same dress as Kaitlin last year? Kaitlin totally flipped and tried to subtly tear Kaylee’s dress! Not that I would do that to a precious Sherri Hill, but I will have a hard time keeping my calm. I already subtweeted Katrina and had my BFFs retweet it. How else can I get my anger across? Ok, sure, she looks good in it, but she could’ve gotten literally any other dress. And, I mean, I got intel that she’s only wearing flats…to prom. I’m wearing four inch silver heels, so I’ll still look better, right? Either way I wanted this dress more, so I deserve to be the only one wearing it. What’s next? Is she going to copy my purse? Up-do? Instagram poses? I have to step up my game. She will NOT ruin the best night of my life.